Engineering giant Siemens has confirmed it is to build major wind turbine production and installation facilities on the banks of the Humber. The company said it would invest £160m in Green Port Hull at the city's Alexandra Dock and in a new blade factory in Paull, East Yorkshire. Up to 1,000 jobs will be created at the two sites making offshore turbines. Siemens said the factories would be operational in 2016 to meet demand for large wind farms such as Dogger Bank. 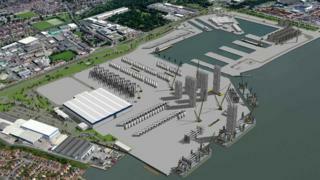 Green Port Hull was first announced in January 2011 and was granted planning permission in May 2012. But it has taken until now for a deal to be signed between Siemens and its partner Associated British Ports (ABP), which is investing £150m in the project. ABP chief executive James Cooper said: "The announcement by Siemens today underlines the critical role the Humber region plays in servicing the UK's energy needs, both today and in the future. "We are delighted that Siemens has chosen to partner with us to realise this exciting project." Siemens said 550 jobs would be created at the factory in Paull, building 75m-long rotor blades designed for its 6MW turbines. Another 450 jobs will be created at the Green Port Hull turbine construction, assembly and service facility. Labour leader of Hull City Council Stephen Brady said: "This is a huge milestone. The project is very complex and it has taken a great amount of time and effort by many parties to get to this stage." He said the council had worked with Siemens and ABP to "establish the Humber as the UK's Energy Estuary". His counterpart at the neighbouring East Riding of Yorkshire Council, Conservative Stephen Parnaby, said: "It is an historic moment for the Humber region, certainly unrivalled in recent history. "The wide-scale economic benefits this investment will have for East Riding businesses cannot be overstated." Energy Secretary Ed Davey said: "This deal is excellent news for the people of Hull and the Humber, the UK, the wind industry, and our energy security. "As well as helping to keep the lights on and putting more than 1,000 people in work, this deal means we will help to keep consumer bills down as we invest in home-grown green energy and reduce our reliance on foreign imports." Maria McCaffery, chief executive of the renewable energy trade association RenewableUK, said: "This is a major coup for the British wind industry - it's the green-collar jobs game-changer that we've been waiting for. "Attracting a major international company like Siemens to the UK, creating 1,000 jobs manufacturing turbines at two sites in Yorkshire, proves that we can bring the industrial benefits of offshore wind to Britain." Friends of the Earth Yorkshire and Humberside campaigner Simon Bowens said: "This world-class manufacturing hub for the offshore wind industry will be a massive boost for the region and our environment. "It's time to end the Chancellor's fixation with fracking and squeezing out 'every last drop' of North Sea oil." Siemens and ABP said they would submit planning applications to Hull City Council and East Riding of Yorkshire Council in the next few months. East coast turbines: An 'excellent investment'?